Stretching from London to Tokyo, Dallas to Baden-Wurttemberg, at last count there’s a total of 14 ‘Globe theatres’ across the world, all of which will help make Shakespeare’s 400th anniversary in 2016 a truly global affair. And for 10 weeks of that year, they’ll be joined by a 15th – New Zealand’s Pop-up Globe, a full-sized replica that will manifest itself in a car park, already nicknamed Bard’s Yard, in the heart of Auckland’s arts district. New Zealander Gregory spent almost 20 years working in the UK and ended up as director of the Maltings, in Berwick-upon-Tweed, where he was responsible for the remarkable turn-around in the fortunes of England’s most remote theatre. He then returned to his homeland to work in his family’s business for two years and, job done, by 2014 he was thinking about returning to the UK and running theatres again, but then his idea for the Pop-up Globe gathered instant momentum. Gregory, who handily possesses a PhD in Shakespearean studies, is recreating the second Globe Theatre – in London, the current Shakespeare’s Globe is a replica of the first incarnation. 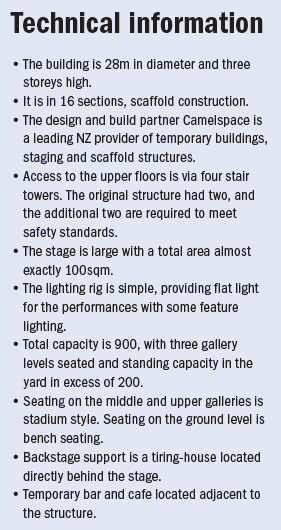 The new theatre is being accurately brought to life via close work with academics in New Zealand and Australia and staging construction specialists Camelspace, based in Auckland, at a project cost of more than NZ$1 million (£432,000). Surprisingly, Creative New Zealand, New Zealand’s equivalent of the Arts Council, would be a logical funder, but isn’t. Instead, the Pop-up Globe’s funding takes a different tack. One of its major sponsors is Auckland Tourism, Events and Economic Development – which is a part of Auckland city council, another is major New Zealand winery Church Road Wines and Australasian ticketing agency Eventfinda. The response from the theatre industry has likewise been positive with companies taking on partnership roles in the project. 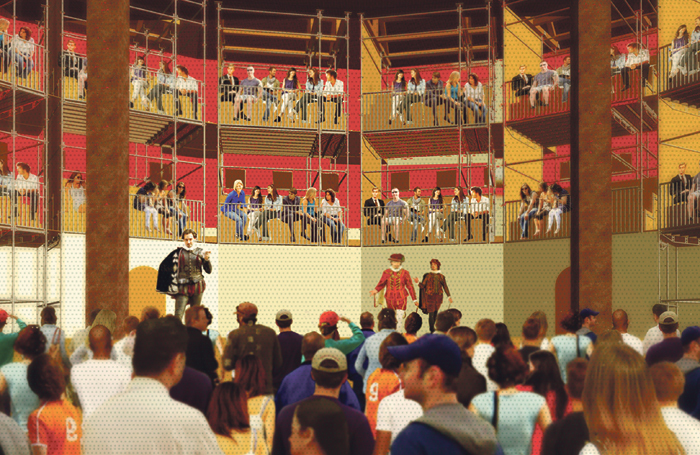 Artist’s impression of the interior of the Pop-up Globe. There is a neat sustainability to the building itself. Only 20% is bespoke, with the remaining 80% using standard scaffolding elements which are found worldwide. When the building is deconstructed, 80% of the material goes back into stock, with the bespoke elements stored to be used again in any future reiteration of the theatre. The stage of the three-storey structure is large, at around 100sqm, projecting into the yard that is half covered by the roof. The yard itself takes 200 standing, while the in-the-round seating for 900 is mainly benches that Shakespeare would immediately have recognised, with the odd section offering premium bucket seating. Plywood is a major material with an outside skin of corrugated iron, an unusual choice perhaps, but locally sourced, since it is a distinctly New Zealand and Australian product. In addition, Auckland University Students’ Association Summer Shakespeare Trust will present The Tempest, directed by Auckland director Benjamin Henson and featuring Lisa Harrow as Prospero. 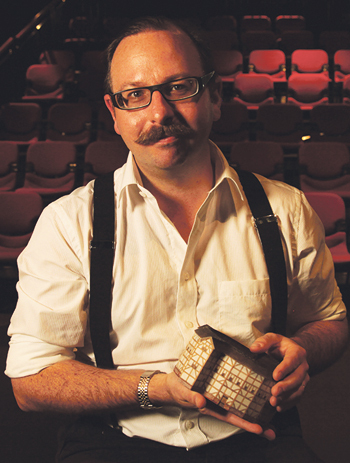 Also announced are Much Ado About Nothing, by the Young Auckland Shakespeare Company, and Titus, an all-male seven-hander by Fractious Tash. There is also the Festival of Curiosities, readings of obscure Jacobean plays – many of which have never been read before in New Zealand – that were produced at the second Globe Theatre. The programme will grow further as the date approaches. 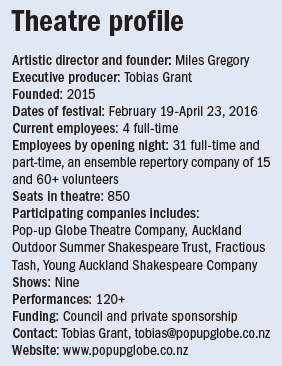 While it is intriguing to consider what will happen to the Pop-up Globe after providing New Zealand with its own way of marking Shakespeare’s anniversary year, the project is clearly generating a fair amount of employment during its brief scheduled tenure. As Gregory points out: “It’s nowhere like London here. It’s quite rare in New Zealand to get 16 weeks’ work in stage acting. But our casts also draw on performers from the rest of the world. In fact everyone’s got stuck in, which was a bit like the Maltings when we said, ‘yes we can have a great theatre here’, and we did. Here in New Zealand we can build a pop-up and everyone’s pretty keen as well, and why not?